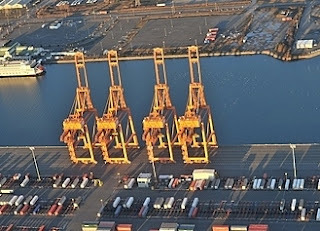 Narrative: Members of the Tacoma Fire Department technical rescue team spent the past two days training for high angle rescues at the Washington United Terminal (WUT) in the Port of Tacoma. The crews simulated the rescues on the 300 foot panawax gantry cranes located on the Blair Waterway. The TFD crews coordinated their efforts with the ILWU Local 23, longshoremen union. The crew practiced multiple rotations of high angle rope rescue systems, belay systems, tag lines, anchor systems and patient pickoff rescues.